Marbled double chocolate bundt cake topped with chocolate and fruit. This isn’t your average bundt cake! It’s fudge-y, moist and very chocolate-y; great for the holiday season! It’s a perfect treat to enjoy with a cup of hot coffee in the morning or with some hot mocha in the evening! Plus, this beautiful and festive swirled cake is very easy to make! If you’re looking for a simple and delicious cake recipe, this is the one! It’s one of those cakes that you can enjoy all week long. I like to keep mine on a tray wrapped with plastic and reheat a slice in the morning. This cake is so good when enjoyed warm! My secret to creating the most incredible bundt cake? Two ingredients: butter and chocolate! These two combined together create an unforgettable cake that simple melts in your mouth. For this recipe, I used melted chocolate to add extra moisture to the cake. If you’re concerned about the sweetness, you can reduce the amount of sugar from 1 cup to 3/4 cup or even 1/2 cup. Make sure to watch my video recipe for all the details. Preheat oven to 350F. Spray a bundt pan with baking spray or butter and flour; set aside. In a large bowl, beat together the softened butter, sugar and vanilla for about 5 minutes until light and creamy. Add the eggs and mix until well combined. Fold in the milk. In a separate bowl, combine the dry ingredients: flour, baking powder and salt. Use a fine mesh sifter to add the flour into the batter, mixing after each addition just until the flour is combined. Divide the prepared batter between two large bowls. Melt the dark chocolate and white chocolate in the microwave. Add the melted dark chocolate to one bowl, the white chocolate to the second bowl. Use a spatula to fold the chocolate into the batter until completely incorporated. Spoon the batter into prepared bundt pan, alternating between dark and white chocolate batters. Then take a knife or flat spatula run through the batter in a swirl motion. Bake in preheated oven for about 60 to 75 minutes, or until a toothpick inserted into the center comes out clean. Remove from oven and invert onto a cake platter. Once cake has cooled, prepare the ganache. Heat the heavy cream in the microwave until piping hot, then add the 1/2 cup chocolate chips. Stir until completely melted and smooth. 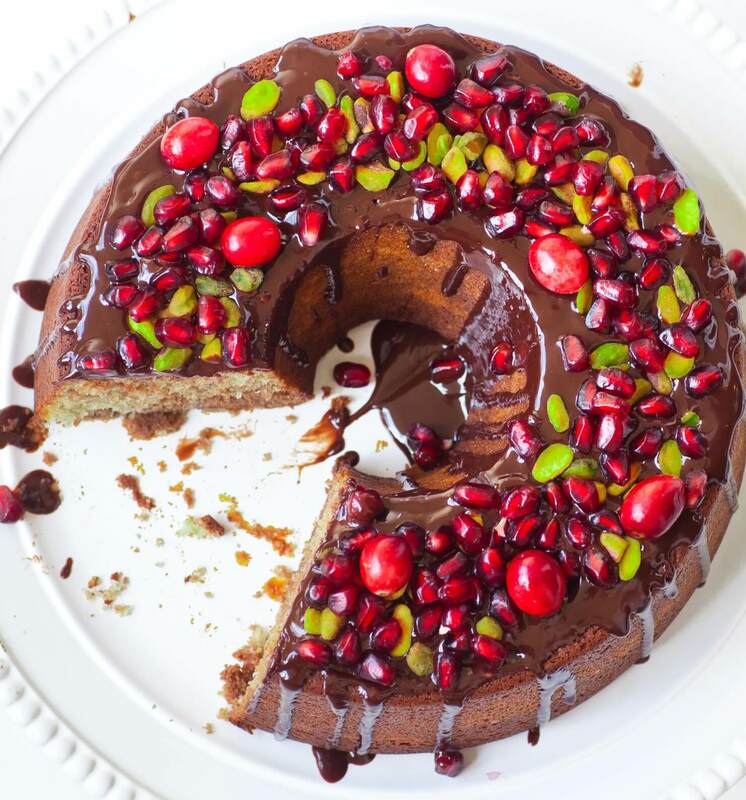 Drizzle chocolate over cake ring, then garnish top with pomegranate arils, pistachio halves and/or whole fresh cranberries. Serve immediately or covered on kitchen counter for up to 2 days. Hi Tatyana! when using a stand mixer, which attachment is better for this recipe?the paddle or the whisk? Thank you so much, this looks really delicious and I can’t wait to try it.